There is no place that helps define the limits and possibilities of the world we live in than a sidewalk. Particularly in the rain. Here we shuck and jive among sharp edged umbrellas, trying not to trip on each other or get poked in the eye. This instinctive, urban dance is universal and umbrellas are the great equalizer. Under them, we are all the same, no matter where we come from or where we are going. Some of us are harder to see, hunched and lost on the edge of glimmering lights and wet reflections. Pause for consideration on this urban march. Kathy Daley is obsessed with the wild, wet reflections and street life on the West Coast. She’s been in group and solo exhibits at art galleries in Alberta, Manitoba and B.C. since 1995, bringing urban and rural scenes to life primary in oil. Daley has had solo exhibits at the Kensington Fine Art Gallery in Calgary, The Front Gallery in Edmonton, more recently The District Foyer in North Vancouver (#Umbrellamovement April – May 2018). 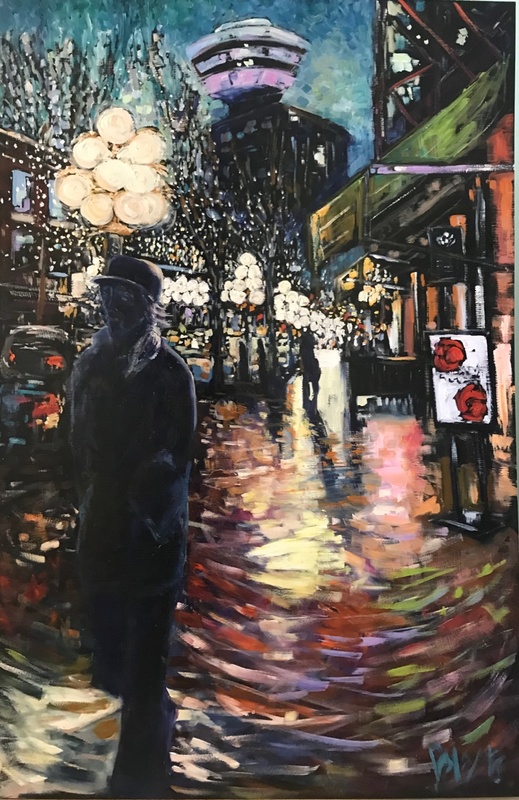 Her painting “Angles” was on the cover of the North Vancouver Community Arts Council’s “You are Here” Calendar and part of a group show at the District Library in North Vancouver in 2017 and The Silk Purse in West Vancouver 2018. Active member of the Federation of Canadian Artists. Kathy recently moved to North Vancouver. She and her dog Billie Jean can be found on the trails when the paints aren’t out.